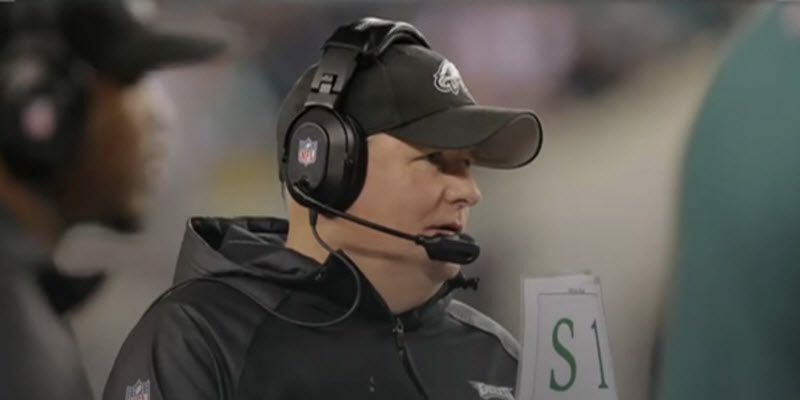 Will Eagle Fans learn to Trust Chip Kelly? Since Chip Kelly took over in Philadelphia he has made huge changes to the roster that now have Eagles fans questioning whether he’s a mad scientist or just mad — and some are now questioning if his motives extend beyond just football decisions. Having watched Chip Kelly lead the Ducks to a 46-7 record over four years, Oregon fans learned to trust his decisions. However, Eagles fans who are already an anxious bunch to begin with — having never won a Super Bowl — have seen Kelly send away major contributors in consecutive seasons. Philly fans were already breathing heavily into a paper bag when Lesean McCoy was traded, and now with Jeremy Maclin on his way to Kansas City they are asking their doctors to increase their prescription of Prozac. I thought it would be helpful to take a look at Chip’s old chemistry set to show Eagles fans why there may be a method to the madness after all. Chip Kelly leading the Oregon Ducks onto the field. Jackson is obviously a tremendous talent capable of breaking a game wide open on any single play, but as Jeremy Maclin showed in 2014, his numbers weren’t irreplaceable. In 2013 Jackson posted career numbers in targets (126), catches (82) and yards (1,332), and he tied his career best with nine touchdowns. These are impressive numbers which anybody would struggle to replace, but his departure to Washington opened the door for Jeremy Maclin to move into the number one spot. In 2014 Maclin posted nearly identical numbers to Jackson’s ’13 campaign: 119 targets, 85 catches, 1,318 yards and ten touchdowns. On the surface it is clear why this trade got so many Eagles fans upset. McCoy had been a star in Pennsylvania even before being drafted by Philadelphia in 2009. The past two seasons he’s carried the ball a total of 626 times while racking up 2,926 yards. Yet again Chip will be faced with replacing a player who provided tremendous production. Fortunately, Chip Kelly has a strong track record of replacing bell cow running backs, going back to his first season at Oregon. In the fall of 2009 Legarrette Blount returned from an eye popping junior season in which he amassed 1,002 yards and a school record 17 touchdowns while sharing time with Jeramiah Johnson, who rushed for 1,202 that same season. Expectations were extremely high for Blount’s senior season until the “Incident In Boise” all but ended his year. Coming off of the loss to Boise and the Blount suspension, Oregon fans’ hopes were crushed. Then entered an undersized freshman running back whom most had never heard of: LaMichael James. James went on to collect 14 touchdowns and 1,546 yards his freshman season and even when Blount was eligible to return, his job was no longer available. While it may be hard for Eagles fans to say goodbye to McCoy, replacing his production may not prove as difficult as it seems — not to mention, the upgrade that Kiko Alonso provides for a defense that took a step back in 2014. In 2014 the Eagles’ defense surrendered five more touchdowns and collected seven fewer interceptions than the previous season. The addition of Alonso and Byron Maxwell should provide upgrades to a unit that was burned badly the final four weeks of the season, giving up nearly 29 points per game in that stretch. The Eagles made a competitive offer for Jeremy Maclin but couldn’t… or wouldn’t come up to meet him at his 11 million dollar asking price. While it obviously hurts to lose a player of his caliber, on top of the other stars who have already found new homes, Chip Kelly has answered similar questions in resounding fashion throughout his coaching career. Chip obviously has enough faith in his system and plan to bet on himself even when Eagles fans aren’t as enthusiastic about taking that gamble. If all of these moves do result in a losing season it would be Kelly’s first since he was the offensive coordinator at New Hampshire. My advice to Eagles fans: trust Chip, he’s done this before.